WYUNA 7 is a stunning newly built, architecturally designed, absolute waterfront Award Winning home. The huge outdoor living patio and central courtyard are a nod to tropical living and mid century influences. The waterfront Patio with heating, fans and outdoor kitchen ensures all year round outdoor living. The huge glass sliding doors open up the whole house blurring the lines between inside and out connecting the occupants to relaxing spaces and the natural beauty of waterfront living. Moor the BOAT soak up the sun, FISH and watch the glorious sunsets from the WATERFRONT PATIO or JETTY of this luxurious new home. Swim and laze by your own PRIVATE HEATED POOL. Play, feed the fish, ducks and pelicans on your own private SANDY BEACH. NW orientation maximises SUNSHINE all year round. WYUNA 7 offers a RELAXING retreat with a holiday feel. See our Facebook page: Getaway2Noosa. The house is set in a TROPICAL private garden. Dine ALFRESCO even when it's raining. WYUNA 7 is in a quiet NOOSA SOUND/Hideaway Island location and is perfectly located midway between the world famous HASTINGS St Noosa BEACH and the trendy Noosaville RIVERFRONT restaurant precinct. It is a five minute stroll to Q Place shops, convenience store, bottle shop, FERRY and award winning restaurants such as RICKY's and WASABI . WYUNA seven provides luxurious, relaxing family accommodation in an ABSOLUTE WATERFRONT Noosa Sound location. Quality designer fittings and furnishings. Discover the stunning waterways of Noosa Sound with FREE use of five KAYAKS during your stay. NB: Please note that the waterfront area is not fenced. BEDDING: 2 King beds, 1 Queen bed, 2 King Single beds ( can be zipped together to form a king bed ). Two pull out ottoman single beds can convert to a queen size in media room available on request an extra charge of $30 per bed per stay applies. Porta cot available $25 per stay. Fully self contained /self catering. Housekeeping can be arranged at your own cost. All Linen except Beach Towels provided. NB: "For your added security, this property is only managed in Australia and we never request payments be made to overseas bank accounts". On confirmation of your WYUNA 7 booking, Maureen will contact you to confirm guest instructions, security code for the gate and keys before your arrival . Strictly No weddings or functions/schoolies - Just great holidays. Due to robberies in the area there are two cameras on waterfront patio aimed towards waterfront and two on front of house aimed towards street. They are purely set up in case of trespassers or thieves. If this is a problem please let me know. Getting to Noosa is easy as there are direct flights to Maroochydore (Sunshine Coast Airport) every day, which is about 20-30 minutes from the house . The local Henry Bus Lines meets every flight from Sunshine Coast Airport and will drop you door to door. Alternatively, fly to Brisbane, about one hour thirty minutes from Noosa. Sunair Bus Lines meets every plane and will drop you at Noosa Bus Depot, five minute taxi ride or 20 minute walk to the house or for an extra charge drop you door to door. If you wish you can hire a car at both airports. house is number 7 . Travelling from Noosaville turn right at the second Dolphin Crescent turn off, immediately before the Munna Bridge and then left into Wyuna Drive. Noosa Main Beach and Laguna Bay. Hastings Street restaurants, bars, boutiques. Noosa Harbour with restaurants, boutiques. Noosa National Park with it's famous coastal path & tracks. World Heritage Fraser Island daily tours. Eumundi Arts and Crafts markets. ALL BEDROOMS have WATER VIEWS and ensuites. Luxuriate in designer stone bath. COVETED NORTH WEST PEACEFUL LOCATION. FULL KITCHEN, SCULLERY, PLUS OUTDOOR KITCHEN with built in Webber BBQ. UNDERCOVER WATERFRONT PATIO WITH HEATING AND FANS. LARGE MEDIA Room come fifth bedroom. HOUSE BUILT AROUND SHELTERED NORTHERLY COURTYARD. MEDIA room with new 65cm Samsung TV. 55cm OLED TV in living room. Samsung 55 cm TV’s in both upstairs and downstairs master bedroom suites. I am a serial renovator and developer who fell in love with Noosa on my first visit many years ago. My first purchase was a run down absolute Riverfront Townhouse I purchased and completely gutted. I created a stunning waterfront sanctuary I named IL Pelicano due to the frequent visits by Mr Pelican and his fine feathered friends. I holiday let this beautiful property for 10 years between our visits. Requiring more room for family and friends I then Purchased an absolute waterfront property across the river I named WYUNAseven. I holiday let this little waterfront Gem for many years before knocking it down and building the new WYUNA 7 in 2016. 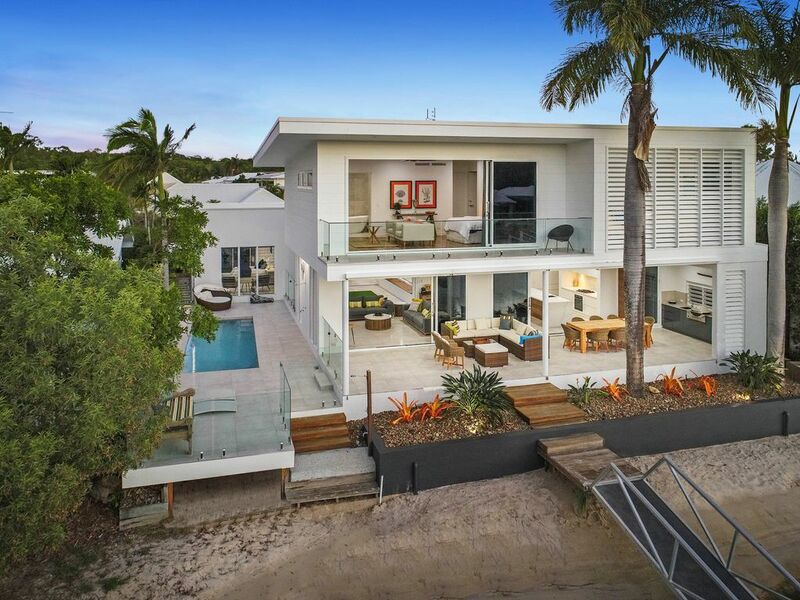 This new luxurious waterfront home epitomises what Noosa waterfront living is all about. The location is peaceful and enjoys a N/NW orientation to capture all that beautiful Noosa Sunshine. The home is designed around a North facing courtyard capturing all the morning sun and providing a cooling late afternoon relaxing space. Doors from the house all open to this courtyard and through to the waterfront blurring the lines between indoors/outdoors. I hope many families enjoy our little piece of paradise as much as we do. N/NW location to maximise available sunshine. Peaceful position for maximum relaxation. A flat walk to all that Noosa has to offer. Beautiful , tranquil water views. The Birdsong, fish ducks and Pelicans that never cease to entertain. toilet, tub, shower, Luxurious walk in shower, stone bath and two stone basins. toilet, shower, Luxurious huge walk in shower, double hand basins. toilet, shower, Full Designer Ensuite. toilet, shower, Separate downstairs shower room beside the Powder Room. All rooms have reverse cycle refrigerated AC/ Heating and fans. Reverse cycle Heating/Cooling. Designer landscape gas fireplace. Double Garage. Strictly no parking on Nature strip or lawn adjacent to driveway as there is a sprinkler system. Towels Provided. Exception Beach Towels. These may be hired at extra cost. Gaggia coffee maker plus a pod machine which takes Vittorio coffee pods..
We provide hotel amenity packs tea, coffee, long life milk, dishwashing, laundry liquid/powder sachets. Shampoo/conditioner for each guest. Check pantry for extra opened items use at your own risk. Plenty of crockery and utensils. Rice cooker, electric Frypan. Designer kitchen with stone benches , integrated refrigerator and 2 Pac cabinetry plus Asko appliances. Scullery with second double door refrigerator, sink and second dishwasher. BBQ outdoor kitchen. Dining table can seat up to 10. Plenty of books for your enjoyment. Connect your Phone music lists for Wireless music. Board games however cannot guarantee all pieces are there. Lawn and garden in Street front courtyard. Pool side courtyard with artificial turf. Large balcony for Master bedroom. 1 Double Kayak and four singles. Huge waterfront Patio with heaters, fans and electronic sun blinds. External electric blinds to be operated by adults only. Do not put up and down in quick succession as the motor could be affected. A couple of fishing rods but can't guarantee the state of them on arrival. Private North facing HEATED pool . Pontoon style jetty to moor your boat. Four life jackets. Kayaks. Magnificent home in the best location! Welcoming & Hospitable owner, will definitely be back! Maureen welcomed us personally to her beautiful home showing us around and teaching us how to operate the entertainment system and appliances. the finished are exquisite and location second to none. the kayaks were fun to use straight out of the underhouse storage and the aspect means you can enjoy the sun by the pool all day. It felt like a slice of tropical bali in the heart of noosa, couldn't recommend highly enough as we'll definitely be back. The house is stunning and has everything you could possibly need. It was a pleasure to host your group and I am pleased you all enjoyed your stay. Thank you for taking the time to submit a review. My wife and I took our 2 kids and their spouses to Noosa for 4 days and stayed at this wonderful property. It is spacious, has quality oozing everywhere and is located right on their Noosa River with its own jetty. 3 minutes by car to Hastings Street and 25 minutesd from the airport. Thes description on this site is factual but doesn’t the property the justice a visit will confirm. The best review is that we will be back. Thanks Maureen. Thank you for your review Stephen. I am thrilled you all enjoyed your stay and it was such a pleasure to host your family. I look forward to you returning one day. Beautiful new property with everything you need and close by to everything! This property was amazing :) it’s kept immaculate, it’s newly designed and so well thought through in the lay out that it just flows, captures plenty of sunshine and makes staying so relaxing! Fishing off the jetty in the afternoons and kayaking up the river in the mornings was just perfect too. Looking forward to coming back soon. Thank you so much for your comments Gavin. I am thrilled you and your family enjoyed staying at WYUNA 7. I look forward to you returning one day. Wonderful stay .. Many Thanks Maureen! The owner Maureen is a wonderful and very informative host... nothing was too much trouble.. ensuring our stay met all expectations. We had 11 family members have the time of their life in this brand new top class accommodation. We made full use of the outdoor kitchen/bbq area and the pool. Plenty of space for everyone and the setting was private and sunny. Kayaks and fishing rods supplied and your own beach and jetty. Wonderful memories! Thank you so much for being our first guests at our new home. It was delightful to meet you and your family whilst you were there. It was a pleasure to have you stay and I hope you return one day.